Sir, actually I have SB Acc in syndicate bank of Byndoor branch (Udupi Dist. Karnataka). Presently I am working in Dharwad by transfer from Byndoor, but still have account in Byndoor branch. On 3rd Feb 2017, I tried to withdraw of 10,000 rs. amount , but ATM machine has given Rs. 2000 less amount only, rest of Rs. 8000 has not been drawn, and Rs. 10,000 amount has been debited from my account. 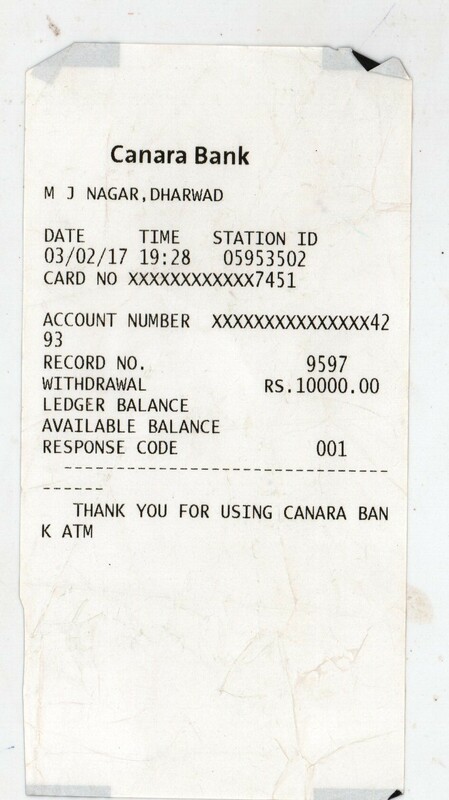 For this disputed money I complained to Syndicate of my own branch on 6th Feb 2017, and they also logged complaint by their procedure, now they are telling that Canara Bank, M.j Nagar Dharwad (this branch ATM has given the less amount), has rejected the query as this as successful. So, what have to do? So I am complaining this problem on Canara bank, MJ Nagar, Dharwad. Sir, you can also check CC TV footages of Canara Bank, which is the main evidence.